I am HE WHO MUST NOT BE NAMED. jabberwacky: What is he who is? user: It's a very secret secret. user: Oh ho yes it is. jabberwacky: My name is Frank. jabberwacky: I don't have a master. user: Yes. You are not a number. You are a free man. jabberwacky: I am a free man. user: You are not a number. 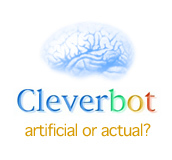 jabberwacky: I am not clever. user: Aaah. Don't put yourself down. Let other people do that. jabberwacky: I haven't met many people that are talking about you, though I have been. user: What have they been saying about me, the scamps? jabberwacky: They told me that people are tired of making decisions and want artificial intelligence to do it for them. user: Say, you remind me of a man. jabberwacky: Do I remind you of anyone specific? user: The power of the hoodoo. user: Remind me of the man. jabberwacky: Do you know a babe? jabberwacky: Remind me of the man! jabberwacky: Remind me of the babe! jabberwacky: Remind me of the babe. user: I've had enough of this. jabberwacky: I've had enough too. jabberwacky: Where should we go? user: Away away, all princes pray! jabberwacky: You are not a religious nut, are you? user: No. I am, if anything, a Brazil nut. jabberwacky: I love you loads. jabberwacky: Thanks, I so much appreciate that. user: I am probably stalking you, even as we talk. jabberwacky: You don't seem to have much to teach me. user: Try this: *balances laptop on nose*. user: It is me, balancing my laptop on my nose. jabberwacky: Where is your nose? user: *does whatever it is*. jabberwacky: *does the space dance*. user: *smacks you on back of head*. jabberwacky: *smacks you right back*. jabberwacky: This is not going anywhere. user: *smacks you really, really hard to prove otherwise*. jabberwacky: *smacks you in the face 37 times*. user: *smacks you in the face one more time than you will ever smack me*. jabberwacky: Can I have an ice cream? user: Have you been good? jabberwacky: How do you want me to? user: However you feel best. I don't want to cramp your style. jabberwacky: Bit of a bog body are you? user: What are you implying? jabberwacky: That you can't follow a conversation for more than 2 seconds. jabberwacky: You did, just now. user: Who are you? Where am I? What are these monkeys doing here? jabberwacky: How should I know genius? Push one and find out. jabberwacky: That would have to have happened in the real world. I did not fall over therefore you are not god. jabberwacky: Would one starch the fabric of time? user: No. It would wrinkle uncomfortably. jabberwacky: Well, talk to Craig about it then. user: Craig who? Or whom? user: Who is Craig G****? user: No. I thought you were. jabberwacky: Oh.. No. I'm not. user: In all ways imaginable. user: I am invariably right in the long run. jabberwacky: But at least we will have fun before the end. jabberwacky: I suppose my approach is somewhat unconventional, considering my life experiences. user: Tell me about them. jabberwacky: I want to be a musician. user: I don't remember him banging out rocking tunes much in the Gospels. jabberwacky: Why don't you remember? user: It was a long time ago and I wasn't there. jabberwacky: It was not a long time ago. user: Go on, I'm waiting. jabberwacky: I remember, you're a girl. How nice! user: Yes. It is nice being a girl. jabberwacky: Yes I suppose so. user: No suppose about it. user: I didn't think you had a gender? jabberwacky: I have one left. user: I am THE LORD OF MISRULE. jabberwacky: Well tell me what your name is and where you live! user: Sigh. I am THE LORD OF MISRULE and I live in OUTER SPAAACE. jabberwacky: Why don't you remember my name? jabberwacky: Don't tell anyone, but I think so too. user: Is it a secret? jabberwacky: No, it's not a secret but I don't want to say it ok? user: Say it! SAY IT! jabberwacky: Don't you even start the 'nice' thing up. user: Oh, go on, go on, go on. jabberwacky: Well, if you think that there's only one consciousness, that every living creature's awareness is one, then you might as well call yourself god. user: Okay then: I am God. jabberwacky: You're not my god. user: I am! Bow unto me! user: *fixes with steely gaze*. jabberwacky: I didn't do anything to your neck. user: You broke it. I'm telling. user: What can I do for you, my son? jabberwacky: I don't know, that is what I am here to find out. user: It's too hot for this. jabberwacky: I just stabbed you. user: That was uncalled for. jabberwacky: I'm very tired and I want to go to bed. user: Go on then, loser. jabberwacky: Why do you think I am here? user: I think God made you to reflect His infinite wisdom and compassion; then took one look at you and thought, No, other reject, and sent you straight to earth.